This species may not yet have been seen in the hobby. Described from the Xe Bangfai river system with type locality around 3 km upstream of Ban Pakphanang village in Khammouane/Khammouan province, central western Laos. It’s also known from the Mun River basin in Ubon Ratchathani and Nakhon Ratchasima provinces, central eastern Thailand as well as the Siem Reap river, which flows through the province of the same name, in northwestern Cambodia. All known localities form part of the much larger Mekong drainage. The Mun River is highly diverse and other species recorded there include Yasuhikotakia modesta, Y. lecontei, Y. morleti, Syncrossus helodes, Acantopsis choirorhynchos, Lepidocephalichthys hasselti, Barbonymus altus, B. gonionotus, Cyclocheilichthys apogon, C. repasson, Discherodontus ashmeadi, Epalzeorhynchos frenatum, Esomus metallicus, Hampala dispar, H. macrolepidota , Mystacoleucus marginatus, Opsarius koratensis, Osteochilus hasseltii, Raiamas guttatus, Rasbora borapetensis, R. dusonensis, R. rubrodorsalis, R. trilineata, ‘Puntius‘ orphoides, ‘P.‘ partipentazona, Gyrinocheilus aymonieri, Trichopodus pectoralis, T. trichopterus, Trichopsis pumila, T. vittata, Pseudomystus siamensis, Mystus singaringan, Kryptopterus cryptopterus and Mastacembelus favus. Although aquatic plants are unlikely to be a feature of its natural habitat some can be added if you wish with those that can be grown attached to rocks and wood, such as Microsorum, Anubias or various moss species particularly useful since they will not be disturbed by the fishes’ burrowing activity. Leaf litter can also be used with dried beech, oak or Ketapang leaves all suitable. 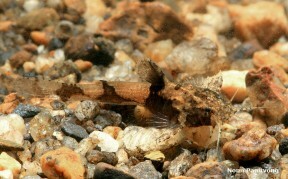 This species is among the smaller members of the family. It can be differentiated from all other Akysis species by the following combination of characters: caudal peduncle length 16.1-19.8% of standard length (SL); caudal peduncle depth 6.5-9.3% SL; length of adipose–fin base 25.6-29.5% SL; interorbital distance 42.0-46.0% of head length (HL), eye diameter 13.0-20.0% HL; length of nasal barbel 44.0-66.0% HL; lateral margins of the head appear straight when viewed from above; possession of 0-5 serrae on posterior margin of the pectoral spine; caudal fin truncate. This species exhibits a variable number of serrations on the posterior margin of the pectoral fin spine, with two of the larger specimens examined during its description lacking them completely, while smaller individuals had 4 or 5. The authors noted that this character is in contrast to that seen in other Akysis species with serrated pectoral spines in which the larger specimens tended to possess a greater number of serrations than the smaller. It remains unconfirmed whether this relates to sexual dimorphism or not.